So far this year, Fairfax County has experienced four battery-related fires. In 2018, there were six fires caused by batteries. As these numbers increase, so must awareness of the proper storage, recycling and disposal of all batteries. There are four types of rechargeable batteries: lithium ion, nickel cadmium (ni-cad), nickel metal hydride and small sealed lead acid batteries (SSLA's under 2 lbs.) These should never be thrown away, but instead recycled. When damaged or exposed, these batteries pose a major fire hazard. Any rechargeable electronic device has a rechargeable battery. Examples include laptop computers, remote control toys, portable power tools, video cameras, cell or cordless phones and walkie talkies. After a certain number of uses, these batteries can no longer hold a charge and need to be recycled. Additionally, damaged, defective and recalled batteries should be recycled. Batteries labeled with Alkaline that are single-use (AA, AAA, 9V, C, or D cell) do not need recycling. Due to the Mercury-Containing and Rechargeable Battery Management Act passed in 1996 that phased out the use of mercury in alkaline batteries, single-use batteries are less of an issue when disposed in landfills. However, all batteries could pose a potential fire hazard if under the right conditions. Therefore, take the precautions listed in the next section for the proper disposal of single-use batteries. 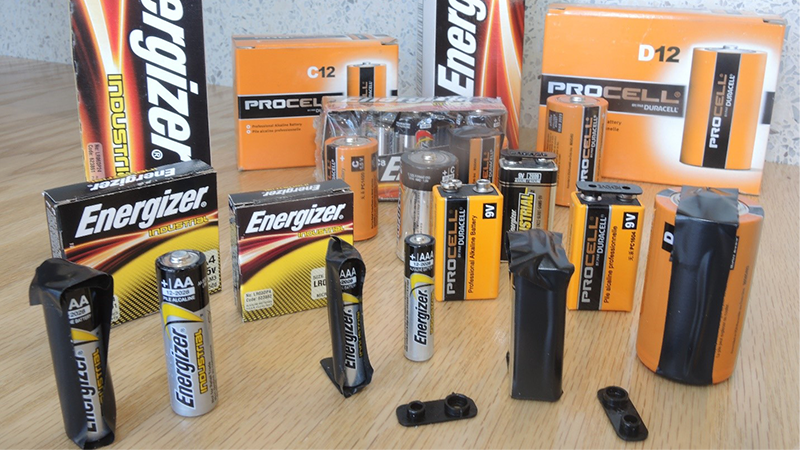 When discarding Alkaline/single-use batteries (AA, AAA, 9V, C or D cell) in your household trash, follow one of these safety procedures before throwing them away to prevent an accidental fire. Place a piece of electrical tape over both ends (+/-) of the battery. Place batteries in their original packaging, sealed with tape.